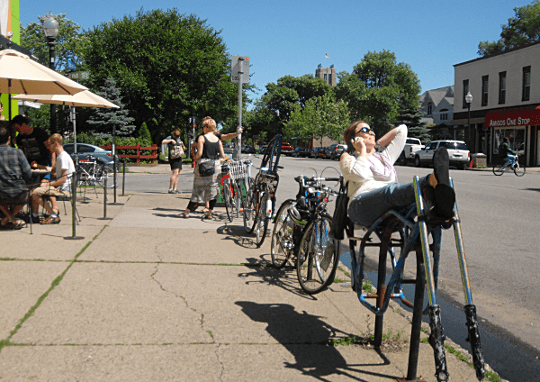 A woman lounges on the bike-frame bike rack outside Modern Times, Minneapolis’s answer to the New Deal Cafe. “Can I take a photo?” I asked. “Hell yeah,” she said. Photos: M.Andersen. Now, don’t get me wrong: Minneapolis is an excellent place to ride a bicycle. This post is not a rag on Minneapolis, one of the most successful cities in the country and a place I’d happily spend $59.95 (or whatever houses there are going for these days) to move to if it ever came to that. Nor am I trying to rank two totally different places, a fun game that’s usually also silly. Instead, this is a quick, honest, unabashedly cursory look (based on a three-day visit last week) at the things that do and don’t work about pedaling around one of the few American cities whose residents’ love of biking seems to match up with ours. 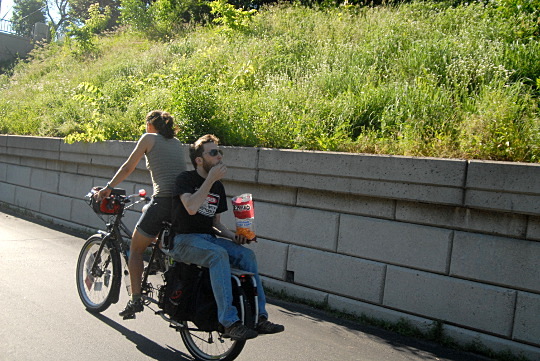 Let’s start with the biggest problem with most Portland/Minneapolis biking comparisons. 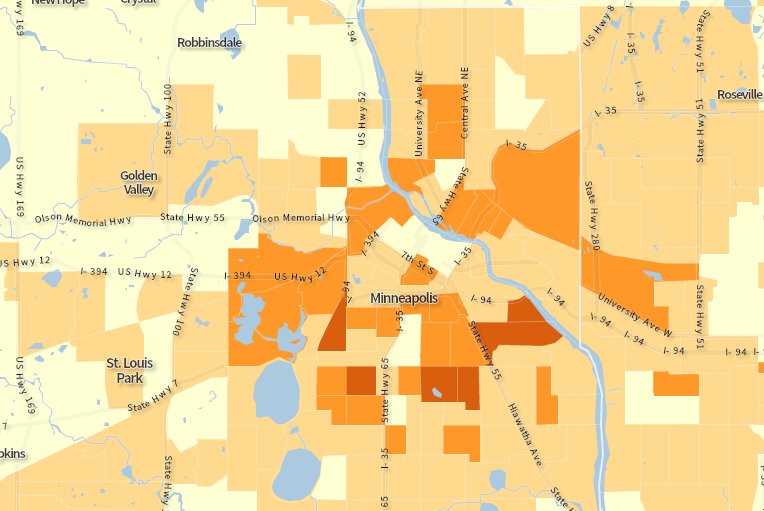 A big reason Minneapolis has such a high bike-commuting rate (4.5%) is where its city limits fall. The Twin Cities metro area has about 50 percent more residents than the Portland metro area — it’s about the population of greater Seattle. But at 55 square miles, its core city, Minneapolis, happens to be geographically tiny and therefore, on average, disproportionately dense. It’s a perfect example of why Census-based city rankings are mostly matters of municipal coincidence. This isn’t a bad thing, and it probably helps elect pro-bike politicians. (When incoming Mayor Betsy Hodges used her first proclamation in office to call Portlanders “wimpy,” I wondered if Charlie Hales was going to take it lying down. He did.) But if Portland’s city limits suddenly shrank to the size of Minneapolis, our bike commute rate would leap to a whopping 9 percent. Cold comfort for East Portland, where the bike lanes would still be terrible. If you want a slightly better apples-to-apples comparison, compare the entire Portland metro area’s bike commuting rate (2.2 percent) to the Twin Cities metro area’s (1 percent). By that measure (which is only a bit less flawed) the Twin Cities area ranks ninth of the 50 largest metros, between Denver and Boston. There are freeways freakin’ everywhere. Above is the majestic seven-year-old cable-stayed bike-ped bridge that connects the Midtown Greenway to the new Hiawatha path into downtown. It’s a beautiful piece of federally funded engineering that deserves its iconic status in the city. That’s Hiawatha Avenue, a six-lane stroad that chops through Minneapolis between downtown and Minnehaha Park. Fifteen years ago, a Hiawatha Avenue expansion project gave rise to the Minnehaha Free State, a beautiful but unsuccessful anti-highway protest; today this is just one of the ridiculous number of expressways that slice the city’s street grid to bits. Minneapolis has spent a lot of money repairing itself with bridges like the one above. But there’s only so much you can do. Portlanders congratulate ourselves more than we deserve for having killed the proposed Mount Hood Freeway through Southeast Portland in the early 1970s. At the time, more or less the same thing was happening in almost every major U.S. city, including Minneapolis. But here’s a fact: today, the Twin Cities metro area has 50 percent more lane-miles of freeway per capita than Portland’s and 39 percent more lane-miles of arterial street. Well after the cheapskates and elitists of Portland started saying “no” to roadway widenings, Minneapolis’s idealistic Lutherans kept on saying “sure!” They created a region that remains deeply auto-dependent. The Midtown Greenway is amazing, but paths are not substitutes for streets. 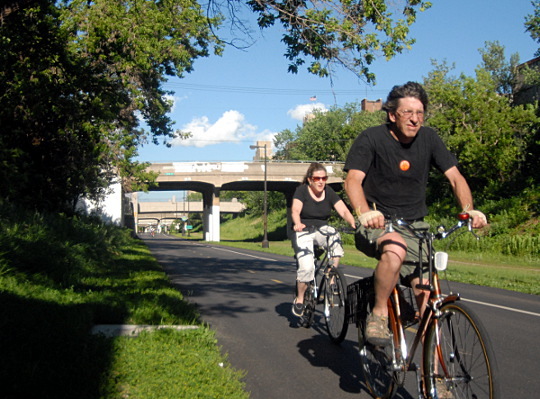 Minneapolis should be proud of the Midtown Greenway. The entire country should be proud of the Midtown Greenway. It’s the most impressive urban rail-to-trail project I’ve seen, connecting commercial, industrial and residential neighborhoods in a straight shot through a sunken, forested railroad bed across the near south side of the city. Its effect on bicycle commuting patterns is practically visible from space. Cheese corn, a.k.a. the good life. 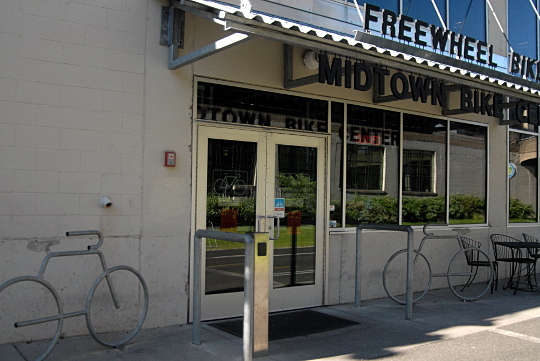 But here is the fundamental limitation of the Midtown Greenway: the only storefront that seems to face it is a bike shop. Off-street paths are wonderful parts of a bike network, and this one blows our Springwater Corridor away on width, location and connectivity. But if I were choosing a commute, I’d take the neighborhood greenways on Ankeny, Holman or Michigan over the Midtown any day. When I ride, I want to enjoy the full culture of my city: houses, cafes, cats. The Midtown Greenway’s links to neighborhoods are numerous and well-marked. But during my third trip on the path, cruising blindly through a city I was supposed to be exploring, I realized what all the curving exit ramps reminded me of. I was on a tiny freeway. Another limitation of paths: safety. One rule of thumb for avoiding urban crime is to always be in eyeshot and/or earshot of at least two strangers. Most city streets would pass that test at 10 p.m. on a Saturday night in June. The Greenway didn’t. I’ll say it again: this off-road path is terrific and I’d be in heaven if Portland had something like it. But off-road paths can’t do everything. The bike lanes are pretty good. Sometimes. The best bike lanes in Minneapolis are as good or better than the best in Portland. The above shot is from Portland Avenue South, the auspiciously named local equivalent of North Williams Avenue. I love the double-barreled buffers, clearly separating bikes from both parked and moving cars. Unfortunately, here’s the same important bicycle route a few blocks north. …and here’s a street that generously invites bicycles into the gutter. …and here’s a vast speed-bait expanse on the northwest side of downtown that didn’t exactly seem to be living up to the potential of the most valuable real estate in the Upper Midwest. Unfortunately, one reason Minneapolis has been able to carve out a lot of room for nice bike lanes is also probably its biggest obstacle to further bike-friendliness. Compared to Portland, its roads are big and its auto lanes are wide. All that pavement invites speeding, slows walking and, despite many awesome exceptions, deadens street life. The waterfront paths are, OK, fantastic. We didn’t get a chance to ride over many of the city’s bridges, though I’m told they’re impressive. But here’s a look at one: the wonderful Stone Arch Bridge, built as a railroad crossing but now a car-free link between the waterfront parks on each side of the Mississippi. Also, I wondered whether or not the folks at Portland Pedicabs have ever put in for a Michelob Ultra contract. The bike parking could use some work. If any city on the continent can match Portland’s bike parking, I haven’t seen it yet. 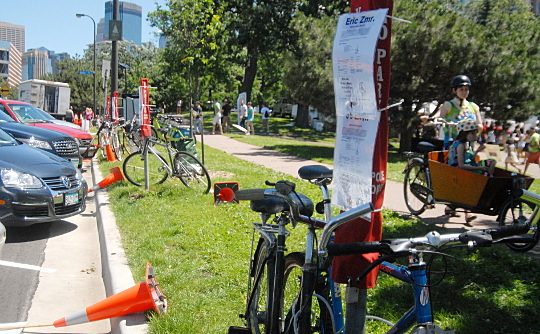 One nice touch in Minneapolis is that some of the auto parking signs double as bike parking. But on a busy Sunday downtown, those weren’t enough to stave off the great American tradition of locking one’s bicycle to any pillar available. Yet another city where biking rates have sprinted ahead of bike parking growth. (In this case, at the downtown Pride festival.) Note the bakfiets-Nutcase combo at right. There are lots of details I haven’t mentioned. For example, one of the country’s best bike-share systems, which plenty of locals were using and seemed to have a station everywhere we wanted to stop. Or the out-of-town bike connections, which I know nothing about but which it’s hard to imagine can compare to the Columbia Gorge or Pacific coast. Or the fact that in a more ethnically diverse city than Portland, the people using bikes seemed much more diverse, too. Four years ago, Bicycling Magazine did both Portland and Minneapolis a big favor when it flipped Minneapolis to the top of its “best bicycling cities” rankings, before reversing the order again in 2012. (I think every single Minneapolitan who learned we were from Portland, bicycle user or otherwise, brought up that ranking.) The magazine’s next two-year update of that list is suspiciously overdue, but I hope it’s on the way, because it’ll give everybody something new to talk about. And I hope that, once again, it’ll use dubious logic to claim that some new American city has become the best place to ride a bicycle. There isn’t a city in the world that knows all the secrets. Let’s all look forward to our next excuse to learn somebody else’s. Michael Andersen is the half-time news editor of BikePortland.org. He joined the team in May 2013 after three years as publisher of Portland Afoot and is proud to be supporting BikePortland's pursuit of new initiatives. With the other half of his time, he works as the staff writer for The Green Lane Project, a project of bike advocacy group PeopleForBikes that assists and encourages cities in the design of better bike lanes. Despite claims to the contrary, it still read to me as slightly snobbish. Portland snobbish? Well I never heard the like. But I didn’t see it that way. I thought this was a spot on analysis of some of the pros and cons of biking here (vs. biking in Portland). I went to Portland a few years ago and biked around and left very impressed by their bike boulevards, their bike lanes along arterials and on bridges, their traffic calmed downtown, their robust transit system and walkable neighborhoods. Believe me, I didn’t want to like Portland (just because everyone had spent so long raving about it). But I couldn’t help myself; a great American city, and a great place to bike and walk. Show me some bike corrals, Minneapolis! They’re everywhere in Portland. Except for being dismissive about things for no reason (“I haven’t tried the out of town trails but I assume they are worse because Portland.”) it was pretty good. However, it relied entirely on anecdote. The size thing was noteworthy, that Portland would have a 9% commute rate if it were smaller like us, but otherwise it was just personal preference based on a few rides through town. If I go to Portland, bike around for 2 days, and say “Meh, I like my bike route at home better” does that make Minneapolis a better bike city? And honestly, neither the St. Croix nor Lake Minnetonka can really hold a candle to that. Mountains and oceans are pretty amazing. True but this was about infrastructure, not destinations. If the argument was about which city has better destinations, then I think it becomes a much more compelling argument that Minneapolis is a better biking city. Score +1 for Mpls! Where are your rad art museums, Portland? “The Twin Cities metro area has 50 percent more lane-miles of freeway per capita than Portland” — I know how we can fix that…. Everybody, send Matt an email if you want to join his freeway-building campaign in Portland. Thanks. Agree with most of what was written, and the spirit of the article – that lively inter-city competition is a healthy thing. Nothing more dangerous that feeling self-satisfied. Or feeling grumpy when someone points out where we still need to make progress. I am tremendously proud of the progress Minneapolis has made in making our city bikable, but if this is the end-of-the-trail, the apex biking condition, then I’m depressed. I guess its understandable that people get prickly about comparisons with other cities. But why can’t we simultaneously feel great about our progress in advancing cycling in Minneapolis, and look ahead to the work we still have to do. Portland HAS gone a bit further than us on their cycling culture/infrastructure learning curve. And yet Portland has a LONG ways to go to catch up with Copenhagen and Amsterdam. No pictures of Portland made it hard to compare. You just put a picture of bad things here and said “We do better.” I guess I’ll take your word for it, but it’d be nice to see what we could be doing better instead of just being told we aren’t. True enough, Joe. I wrote this for a Portland audience, of course. And this was just something I pulled together based on where I happened to be riding during my vacation. It certainly wasn’t a comprehensive look at the city; the many thoughtful comments beneath this post on BikePortland (linked above) add a lot of useful nuance that I didn’t. Pretty typical attitude in viewing transportation as a zero-sum game- that it’s necessary to deliberately mess things up for cars to encourage bicycling. Enjoy Portland, I’m staying here and enjoying our freeways and low housing costs. Cars have deliberately messed up cities for people. FWIW, most people in Portland seem to love living there. While great for cycling, wouldn’t call Portland a biking paradise either. It would be better for both mpls and portland to acknowledge there is a lot to be desired. Michael, thanks for posting this. Great insights (and I’m a huge fan of bikeportland.org). This though is like Burger King saying their food is as healthy and nutricious as McDonalds. We are both bottom of the barrel and should both be comparing ourselves to The Netherlands with a side of Sweden, Finland, Germany and maybe Copenhagen (unless our only goal is to feel good about ourselves or sell a lie to those more ignorant). we are so overbuilt with freeways carving our cities. it’s depressing. i often ask my parents what south mpls was like before 35w cut it’s swath. thanks for your, imo, honest assessment of the bike culture/scene. This is one of the best travelogue transportation critiques I’ve read. It struck me as balanced and as reasonably-well researched as should be expected. That said, it seems to me to be problematic to criticize the Midtown Greenway for bypassing retail destinations but claiming that neighborhood greenways do a better job of accessing them. There are many neighborhood greenways in Minneapolis, but nearly all the retail areas are on major arterials, so they do just as bad a job as the Midtown Greenway at accessing destinations. From my brief experience in Portland, this seemed to be mostly true there as well. That plus the non-freeway barriers and attention to detail on places like bridge crossings makes for a more contiguous and useful bike network. Why does the bike lane on 12th St. S. just end at 2nd Ave? Where is the east/southbound biker to go after reaching that corner? Turn left illegally onto the bus-only northbound lanes on 2nd (and while we’re at it, why are these not bike and bus lanes?)? Straight into the parked cars? Oh, I get it now, the biker’s supposed to turn right (still no bike facilities, but hey, the traffic is light), pass the Convention Center and make an infinite loop of circles back to this spot. Bikes are allowed on the Marq-2 bus lanes except for the peak direction. This is of course a crumb to toss to cyclists in our still commuter-oriented downtown, but it is pretty nice outside of peak in my opinion. Hm. If that’s right, the signage at 2nd & 12th is not very clear. Perhaps bikes are “authorized vehicles” although I don’t how one is supposed to know that. Yeah, bikes are an “authorized vehicle” outside of peak. You’re right, it’s not clear at all. Spread the word! Agreed about Portland’s network being more contiguous & useful overall, just thought that the greenways were a mixed bag and more useful for recreational or distance riding than destination access. Sadly, the most interesting commercial stretch of SE Hawthorne in Portland is six lanes, all auto-oriented: free parking on each side, two general travel lanes in each direction, no bike lanes and ho-hum sidewalks. Hawthorne should be one of our best streets but isn’t. In other words, see Walker Angell’s comment above. But we do have some other road-dieted destination streets, and thanks to narrower lanes, sidewalk bumpouts, bioswales and human-scale stoplight intervals, plus the much higher bike mode share in Portland’s best biking neighborhoods, I think the major streets are also less scary than in most cities, including what I saw of Minneapolis. see shows what I know about Portland. For some reason, I thought Hawthorne was very walkable/bikeable in the parts that I experienced. Great post! I do not understand the sensitivity/rivalry. You are all from the same country (tribe), and even more importantly part of the global bike community. We should really work to improve biking all over the country, and possibly create some sort of union of Bike Portland and Minneapolis Bicycle coalition. If urbanists and city/county engineers from both cities can meet and share creative ideas, or even make bike infrastructure purchases together to get a better prices, why not? The last time I checked climate destabilization will affect all of us. In addition, just because I love living in MInneapolis, I am happy that has amazing biking facilities (by American standards) exists, because I want to go there for vacation with my family. The my city vs. your city mentality might work to get people who love cars to care a tiny bit about bike infrastructure, but for those of us who want liveable, equitable, bike friendly communities, there is no need for that. Viva Portland! Viva Minneapolis! This reminds me of a ‘joke’ I once heard to never travel with anyone from Portland, they will spend the entire trip complaining about how much better everything is in Portland. Why should you always go fishing with two Portlanders? Because if you only take one, they’ll bike on all your bike lanes.